The outcome of the 2016 presidential campaign could determine whether an end to prohibition is in store any time soon. So who are the candidates in favor of legalization, or against it? Most have been luke warm or down-right against marijuana in the past. But given the rising acceptance nationwide, with more than 53 percent of Americans in favor of some form of legalization, candidates who were once against it are beginning to soften their stance. The Marijuana Policy Project (MPP) has graded each of the candidates on their position going into the 2016 election cycle. To gain a clearer picture on how the 49th president could respond to legislation during his or her own term, we decided to look into each candidate’s past and present position on legalization to make an educated guess about how they’d respond if federal reform took place. Here they are in ascending order from least to most likely to support federal legalization of marijuana if such legislation were passed in Congress. As chance would have it, our own projections coincide with the grade each received. Let’s start with the GOP candidates in favor of legalization: Zero. Present: “I think we can look at it.” Medical use that is. 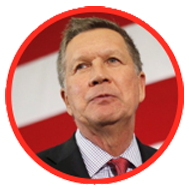 In 1999, when John Kasich was still in Congress, he was a vocal opponent to any drug reform. When HR 3064 was passed to provide $430-plus million dollars funding to Washington DC, Kasich pushed for provisions that would ban the use of federal funds for needle exchange programs and bar enactment of an approved ballot initiative to legalize the medicinal use of marijuana, among others. More recently Kasich has eased up on the issue publicly. At a town hall in February this year, he seemed more closely aligned with Cruz’s laissez faire approach stating that states should “probably” be allowed to establish their own laws. He went as far as to say, “I think we can look at it,” although, on several occasions, his home state of Ohio tried with no luck to get medical marijuana on the ballot. Despite polls indicating widespread acceptance of, at the very least, medical marijuana, no measures have ever made it past the Ohio State Legislature. In April, 2015, during an interview on the Hugh Hewitt Show, he said, “[The citizens of Colorado and Washington State] have decided that they want to legalize it. I think it is appropriate for the federal government to recognize that the citizens of those states have made that decision. One of the benefits of it, is we can now watch and see what happens in [there].” Oddly, that statement seemed to have been adopted out of Hillary Clinton’s play book on the subject, almost verbatim. Whether he would use executive power to veto any pro-legalization legislation if passed by Congress remains to be seen. Given his disapproval of State legalization, it’s entirely possible. According to MPP, Donald Trump has never been a drug user and doesn’t drink. And yet, in the early 1990s, he made no bones about advocating for legalization of drugs, and not just marijuana. 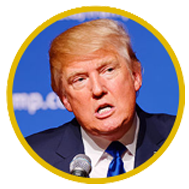 Until recently, he has remained rather neutral on the subject on the campaign trail. Whereas his rival GOP candidates have softened their stance considerably to align with their target voters, ironically, Trump seems to have hardened his stance. He’s now more aligned with the party line on marijuana, at least publicly. In a GOP debate that took place last year in June, he told a CSPAN moderator, “I’d say [regulating marijuana] is bad. Medical marijuana is another thing, but I think it’s bad and I feel strongly about that.” When the moderator asked about what he thought of the state legalization aspect, he replied, “What about the states’ right aspect of it?… If they vote for it, they vote for it… But I think, medical marijuana, 100%. It should be [legal]. As for whether he’d change his mind if elected, there’s no telling. As often as he changes his mind on other issues, it’s a coin toss whether he’d revert to his 1990s stance and support legalization and regulation, or “just say no” and stick with the party rhetoric. In an interview the following day, she expressed support for allowing states to adopt their own marijuana policies and said she would not want the federal government to interfere in them. On November 7, 2015, Clinton said she supports reclassifying marijuana from Schedule I (dangerous drugs with no medical benefit like heroin and LSD) to Schedule II (dangerous drugs with high potential for abuse like cocaine, meth and oxycontin) in order to remove barriers to researching its medical benefits. It seems the pharmaceutical industry may have some competition lately. Hedge fund tycoon George Soros, a notorious and highly-vocal advocate for marijuana legalization, recently donated $1 million to Clinton’s super PAC. Two things about which Clinton doesn’t need to “wait and see” is 1.) her support of rescheduling medical marijuana to allow for medical research, and 2.) her support for reforming the criminal justice system when it comes to prosecuting marijuana offenses. Although she hasn’t explained how she feels rescheduling marijuana would rectify the discrepancy between state and federal law, she see’s the problem with incarcerating minor drug offenders. “I agree completely with the idea that we have got to stop imprisoning people who use marijuana. Therefore, we need more states, cities, and the federal government to begin to address this so that we don’t have this terrible result of a huge population in our prisons for nonviolent, low-level offenses that are primarily due to marijuana,” Clinton said in a CNN debate in October last year. When the campaign dust settles, and campaign contributions aren’t influencing her public stance, it’s likely a President Clinton would throw caution to the wind and side with the majority of Americans in favor of legalization. Present: Having marijuana listed as a Schedule 1 drug alongside heroin is crazy! Of all the presidential candidates, Bernie Sanders tops the list of candidates in favor of legalization. His support of cannabis dates back to his days as mayor of Burlington, Vermont. “When I was mayor of Burlington, a city with a large population, I can tell you very few people were arrested for smoking marijuana. Our police had more important things to do,” he told Reddit AMA in May of 2015. During that town hall, he made clear that he believes addiction is a health issue, not a criminal issue and that making it criminal is very much a race issue. In November 2015, Sen. Sanders proposed legislation that would allow states to regulate marijuana like alcohol and ensure canna-businesses could access banking services and standard tax deductions that currently are not available due to federal marijuana laws. If passed, the legislation would also remove marijuana from the federal drug schedules and states that legalize marijuana would no longer be subject to federal interventions. We’re convinced that a Sanders presidency could very well mean the end of prohibition as we know it. 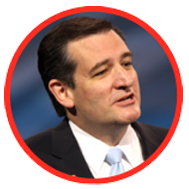 Contact Sen. Ted Cruz’s campaign and urge him to support ending marijuana prohibition and replacing it with a system in which marijuana is regulated and taxed similarly to alcohol. 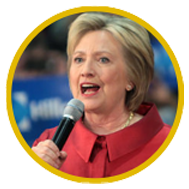 Contact Hillary Clinton’s campaign and urge her to support ending marijuana prohibition and replacing it with a system in which marijuana is regulated and taxed similarly to alcohol.